Bouncing Buttons crafts making it simple: Quick Pilgrim hat. 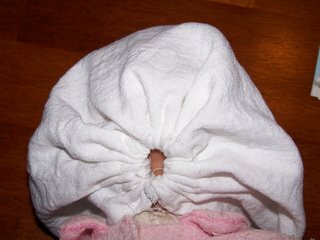 Pilgrim hat can fit from baby to adult (depending how far your roll the ends). WARNING! This was something I came up with as I went along. It is NOT as NICE as ones you can buy a pattern for. My little girl is to young to care so it works for us. 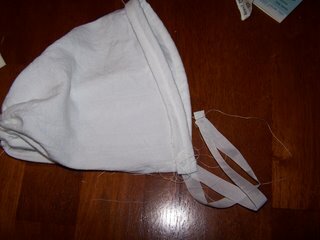 Very fast pilgrim girl bonnet..... 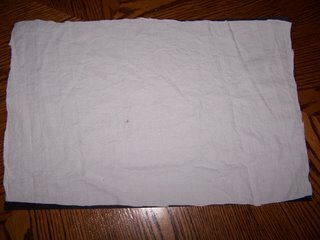 I cut out a piece of fabric 12 X 18 inches. This was large enough for me (an adult to wear). The next hat I do will hem around the outside first this one I did it as I went along. 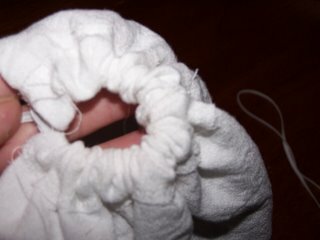 This is shows the elastic along the one end. Sorry about the blurry picture I am in a hurry. When pulled tight it makes the back of the hat. The opposite end of the hat got rolled up to make it the right fit for my 17 month old. 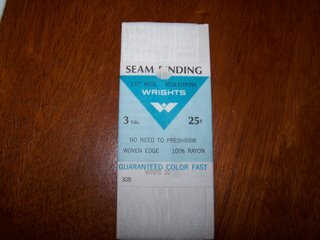 This came from my MIL (she keeps lots of stuff) this was 25 cents new. I found it in a box of stuff she sent me. It worked great for the ties! Project took only a few minutes! COST...... $0 YEAH! 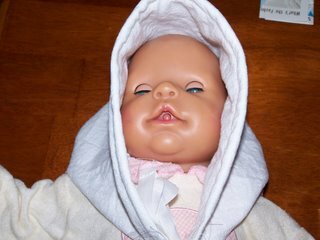 This is it on a baby doll with a tiny head (my DD's head is a LOT larger). This is the back. I still need to snip the strings. I was making it up as I went along and I didn't want to waste time snipping if it didn't work. KWIM? I will post my Indian costume in a few minutes. I am making costumes adding the pictures to my blog and taking care of my children all at the same time. My children get a little wild around this time of night. I hope to get this all done in the next few hours. 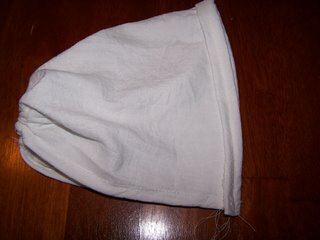 Thank you very much for posting your pilgrim bonnet. 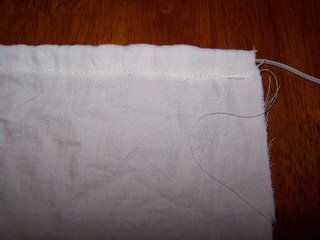 It was a big help to an inexperienced seamstress!